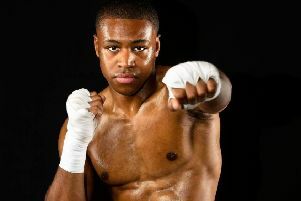 Luton boxer Linus Udofia returned to the ring with a one-sided victory over Slovakia’s Michal Gazdik at York Hall on Saturday. Gazdik had promised to knock out Udofia but it wasn’t to be as the former Hockwell Ring fighter outclassed his opponent throughout all eight rounds. There were times early on where Gazdik (3-0) seemed there for the taking, but as Udofia explained later his opponent was more difficult than expected. He said: “He was awkward, he could hit hard and I let him come at me in the early rounds to see what he could do. Over 200 Udofia fans descended on York Hall to watch their hero go 11-0 and showcase his trademark combinations and footwork throughout the bout. There were gasps aplenty throughout, as he inflicted both right and left uppercuts on Gazdik who continued to march forward regardless. Udofia, who made his debut back in March 2016 with victory over Sonny Whiting, continued: “I let go of a few combinations and I snapped his head back a few times. The Goodwin ‘Strike’ show was originally billed to host Udofia’s first chance at the Southern Area title, however his opponent Tey Lynn Jones pulled out citing injury as fight week loomed. Unperturbed Udofia showed consummate professionalism and is now aiming toward the rearranged date of March 2 albeit with a little scepticism. He added: “My next focus is March 2 and my title fight, I’m trusting him to turn up this time but my manager and I are working on a Plan B.